Polyoxymethylene (POM) Market size was more than USD 5 billion in 2016 and will witness 8.8% CAGR during the projected timespan. Increasing trend of replacing metal components in automobile with plastic materials shall be a prime factor driving polyoxymethylene market size growth over the forecast period. Polymers and engineered materials have experienced a real boom in automotive industry in past few years and their application is increasing with a tendency of further growth. The extensive application of polyoxymethylene in vehicles shape the visual appeal of automobiles, their functionality, economy and fuel consumption. Automotive (passenger cars and commercial vehicles) market was almost above 90 million units in 2017 across the globe. Increasing consumer expenditure has prominently driven the automobile market growth in past times. Polyoxymethylene plays a key role in manufacturing of automobile vital parts and components. Thus, automotive industry growth shall positively influence polyoxymethylene demand in the next few years. Polyoxymethylene market is also experiencing surged demand from medical industry. The application fields are diverse and range from segments such as joint reconstruction, spine, traumatology and various others. The product is also being used in manufacturing pacemakers, artificial heart valves, etc. This increasing application scope in medical industry shall be positively influencing polyoxymethylene demand over the forecast timeframe. The two major challenges for polyoxymethylene market during the forecast period will be environmental issues associated with product usage in plastics and constant fluctuation in its feedstock prices. Oscillating formaldehyde prices causes imbalance in polyoxymethylene manufacturing and distribution costs, which directly impacts the supply demand dynamics across the globe. 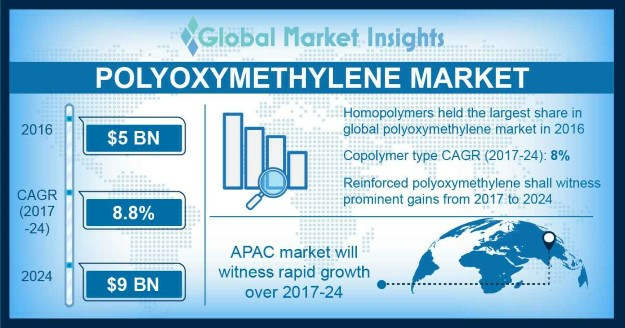 Homopolymers held the largest share in global polyoxymethylene market in 2016 and shall hold the same position over the forecast period. Homopolymer polyoxymethylene, commonly known as Delrin, is majorly used in manufacturing automotive components due to their high tensile & impact strength, superior room temperature strength and stiffness. It is also used to manufacture industrial components such as pump impellers, conveyor plates, sprockets, springs, gears, couplings, etc. Copolymer polyoxymethylene will be witnessing significant growth rate of approximately 8% over the projected timespan. Copolymer polyoxymethylene offers superior performance at slightly lower costs compared to homopolymers. Additionally, it has improved dimensional stability over comparable homopolymer formulations owing to its negligible crystallinity levels. The only difference between these two types is that homopolymers are 100% formaldehyde and copolymers have a minor amount of comonomers such as dioxolanes which improve the thermal stability of plastics. Standard polyoxymethylene held a major share in polyoxymethylene market in 2016. This grade held the maximum share, in terms of both, volume and revenue and shall witness significant growth rate in the coming years. Recycled grade polyoxymethylene is gaining popularity among manufacturers owing to its eco-friendly dimensional structure. Reinforced polyoxymethylene, which is usually glass reinforced has shown excellent results in dynamic working conditions and hence becoming a preferred alternative to standard polyoxymethylene. Different grades of polyoxymethylene will experience demand from different sectors due to their unique physical and chemical attributes that make them distinguishable from each other. Automotive industry, held a significant share in global polyoxymethylene market in 2016. The application segment shall witness considerable growth in polyoxymethylene market over the forecast duration. The product is widely used for manufacturing seatbelt components, brackets, buckles, switches, latches and components with snap-in joints in automobiles. The usage of polyoxymethylene also results in low emissions from automobiles as it reduces overall vehicular weight, which is making it a popular choice among manufacturers for replacing metal components. Consumer goods segment shall experience significant gains in polyoxymethylene market in the coming years. This can be attributed to polyoxymethylene usage in manufacturing consumer products such as garden sprays, butane lighter bodies, zippers, toys etc. China, India, Brazil, Mexico, Thailand and some other Asia Pacific and Latin American countries have emerged as huge potential markets for consumer goods, due to increasing per capita income of consumers, which has led to higher consumer products demand and subsequently higher polyoxymethylene demand. Asia Pacific accounted for the largest share in the polyoxymethylene market in 2016, in terms of volume and revenue. Exponentially growing automotive industry in Asia Pacific, mainly in China, Japan and India has played an important role in polyoxymethylene production and consumption in recent times. Moreover, the rising demand for consumer goods in Asia Pacific and Latin America is likely to fuel polyoxymethylene demand over the next few years. The mature markets of North America and Europe are likely to show sluggish growth rate during the forecast timespan, although, high product prices in both these regions have led to their high revenue shares in polyoxymethylene market. Global polyoxymethylene market witnessed intense competition from major players in 2016. Key market share contributors in POM industry are China National Chemical Corporation (ChemChina), SABIC, BASF SE, Korea Engineering Plastics Company Limited, DuPont, Asahi Kasei Corporation, A. Schulman Inc and LG Chem. These companies have global presence coupled with wide supply & distribution network and deep penetration roots in market. Other companies functional in POM industry are Barlog Plastics GmbH, Mitsubishi Engineering Plastics Corporation and Formosa Plastics Corporation. 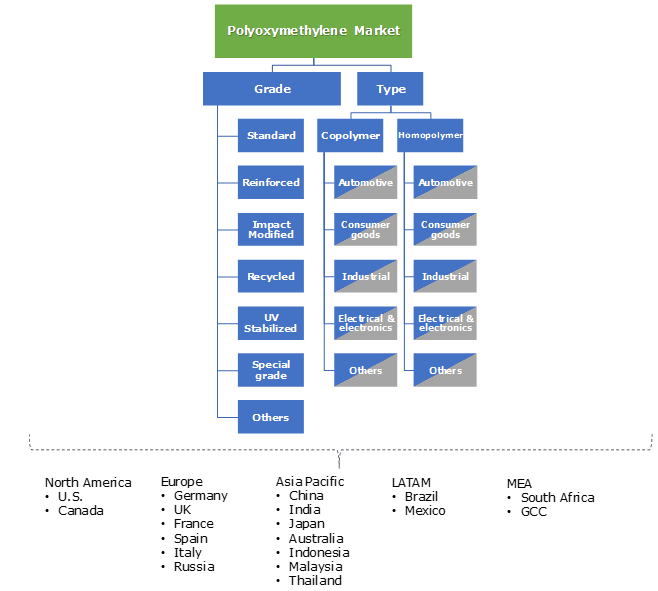 Few companies in polyoxymethylene market are completely integrated and perform functions such as raw material & product manufacturing, processing semi-finished and finished parts and managing distributors for penetrating into new geographical areas. Major polyoxymethylene producers are continuously experimenting with their polyoxymethylene grades in the market. For example, Celanese Corporation introduced a new product line of copolymers in 2013, by expanding its S series of impact modified polyoxymethylene which includes two new toughened XT grades suitable for applications requiring flexibility and impact strength in challenging environments. Another company, Asahi Kasei began operation of its new polyoxymethylene plant in Germany in 2016, with a view to enter in European automotive market. Polyoxymethylene is a high-performance thermoplastic, which has wide variety of applications across automotive, industrial, consumer goods and electronics & electrical industries majorly. It has outstanding fatigue endurance, wide end-use temperature range and excellent resistance to moisture, solvents and various other neutral chemicals. Polyoxymethylene industry has always been propelled by continuous inventions and hence various patents have been registered regarding its manufacturing process, biodegradability, etc.